While opening up Christmas cards from various friends and companies, I came across the pictured holiday card. I’m sure when most people saw the card, their hearts were filled with good holiday cheer. 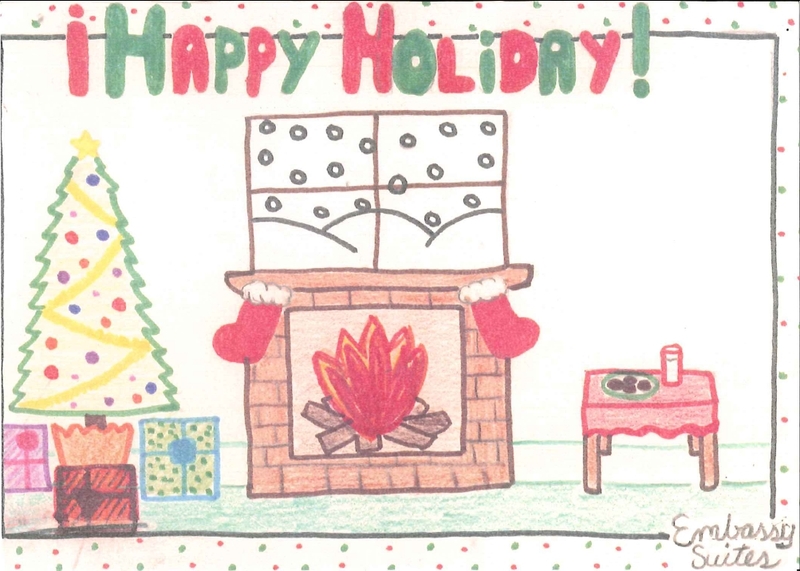 They were certainly touched to find out that a 7th grader submitted this idillic Christmas scene to a local art contest. Why aren’t there any people in the picture? They’re all in bed, too sick to open the presents under the tree! Unfortunately, this situation isn’t limited to children’s drawings. Many homes have “ventless fireplaces” that aren’t much different than the picture. Granted, they burn natural gas instead of logs, thus reducing some of the harmful by-products. Nevertheless, all the by-products enter the home because there is no chimney for exhaust. If you would like to learn more about the IAQ implications of unvented fireplaces, I would start with the Indoor Air Journal article “Measured concentrations of combustion gases from the use of unvented gas fireplaces” by P. W. Francisco, J. R. Gordon, and B. Rose from my alma mater, University of Illinois. I wish you the best this holiday season. Have a nerdy New Year! Maybe it has a direct vent to the exterior and the family is outside enjoying the snow. I have a ventless fireplace and won’t use it because it seems like common sense to me that it can’t be good. I even have the gas line turned off. The instructions on the warning placard say you need to leave a window cracked if you choose to use it. Doesn’t that defeat the point of trying to stay warm in a Chicago winter? I think these fireplaces are dangerous and useless. When everything is burning efficiently their by-products are only humidity and carbon dioxide. The problem is that they don’t have a “fail-safe”. If anything goes wrong, you breathe it in.